The lamp post comes with mounting hardware for installation on a cubic-foot concrete base*. 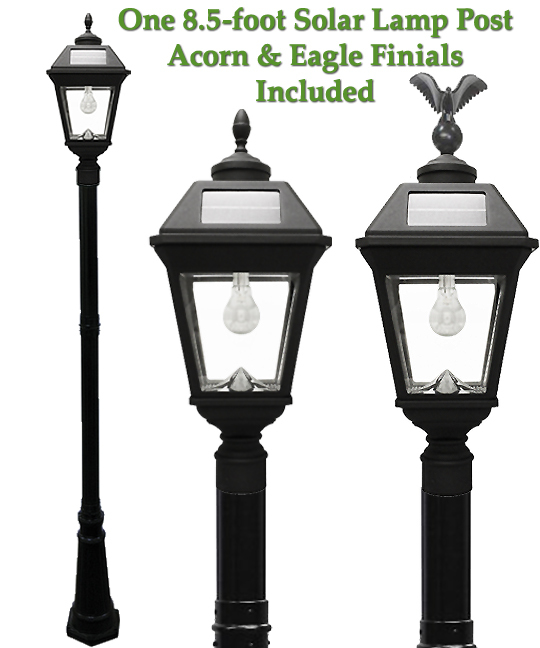 The updated Imperial Solar Lamp Post combines the latest in solar lighting technology with a classic and elegant style. Quality components, housing and real beveled glass panes add to the rich look and long-lasting appeal. The water-tight housing is made of cast aluminum with a long-lasting, low-maintenance black powder coated finish that unlike paint is highly resistant to chips and scratches. The new, improved and more subtle cone reflector intensifies and effectively casts light from a new LED that looks like a regular AC light bulb. Another advantage of the Imperial Solar Lamps: two battery compartments and now, two battery packs. 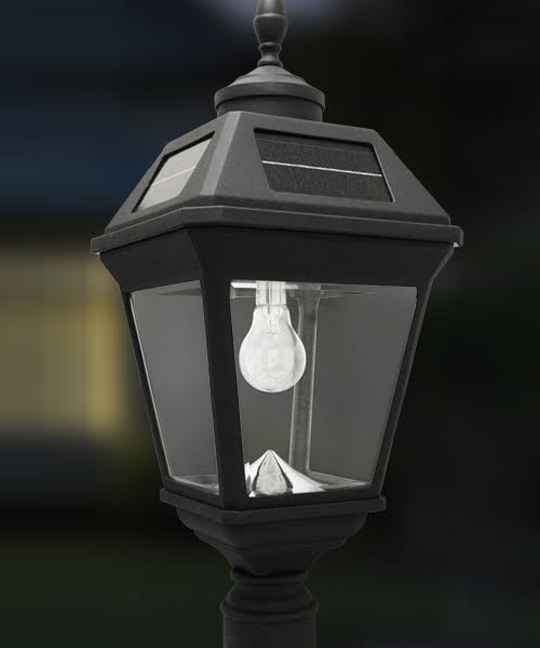 Imperial Solar Lamps (not to be confused with our commercial-grade Imperial II series), have compartments for two powerful lithium ion (Li-Ion) battery packs and the new models come with two battery packs. The extra power means longer running times. The high-grade solar panels store power each sunny day in the packs. At night, a rechargeable battery pack powers the lamp. Once the energy in the first battery pack is expended, the Imperial will stay bright by running on a second back-up battery pack for bright, warm-toned illumination even after cloudy days. On a full solar charge (6 or more hours of direct sunshine), you can expect 12 hours of reliable light. Once the first power back’s stored solar power is spent, the extra battery pack kicks in. 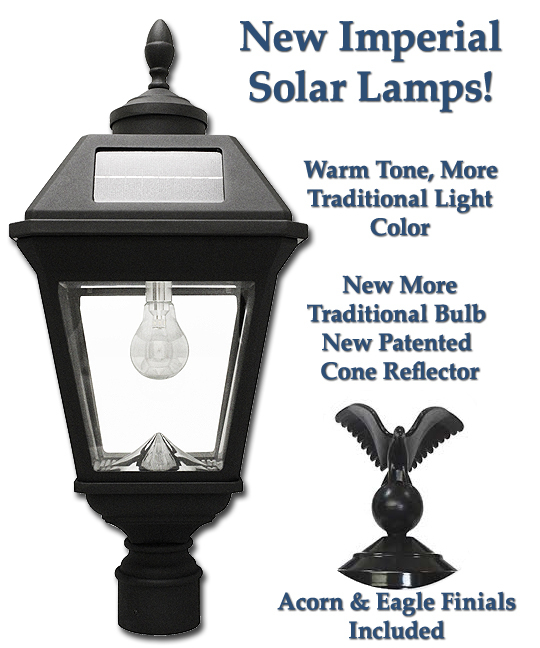 The Result: Imperial Solar Lamp Post has long and reliable operating times. even after multiple days without sun. Not only does the LED bulb look more like traditional bulbs, so is the warm colored light it casts. At 180 lumens, the light is similar to that of a 35 watt incandescent bulb in low setting 45-50 watt bulb in high setting. The longest run times are in the low position which is recommended for late fall through spring to get the longest running times when days are shorter than nights. *In areas of extreme cold/deep frost lines, a deeper base is recommended. We do not recommend the EZ-post anchor for the Imperial or Imperial II Lamp Posts we carry.